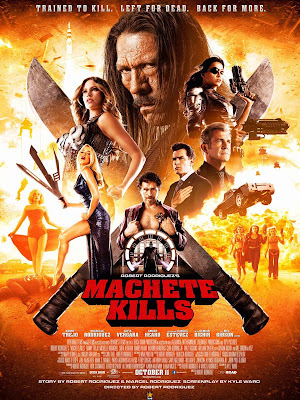 Machete Kills is the sequel to Robert Rodriguez's 2010 Grindhouse cult hit and Danny Trejo vehicle, Machete. 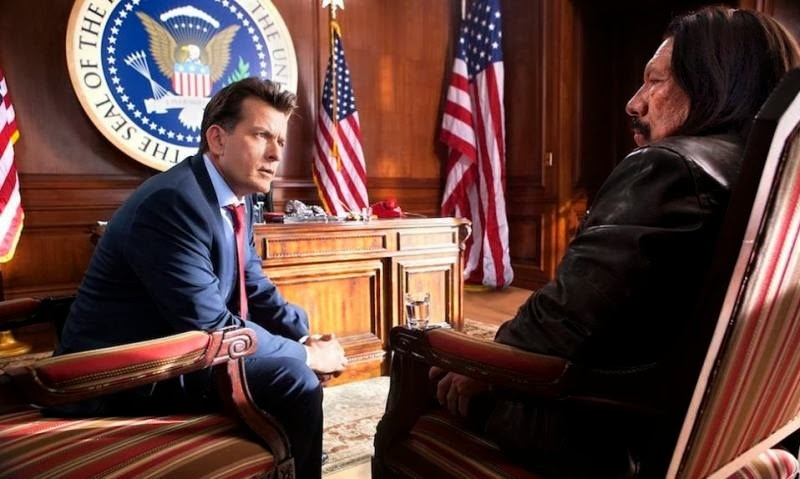 This second installment once again features Trejo along with a star studded cast that includes Mel Gibson, Demian Bichir, Amber Heard, Michelle Rodriguez, Sofía Vergara, Jessica Alba, Charlie Sheen, Lady Gaga, Antonio Banderas, Alexa Vega, Vanessa Hudgens, and Cuba Gooding, Jr.
Machete (Trejo) is back and this time he is tasked with stopping a man named Mendez (Bichir) who is threatening the very existence of Washington DC with a missile strike from across the Mexican border. After losing someone very close to him, Machete has vowed not to get involved, but the one and only President of the United States (Sheen aka Carlos Estevez) convinces him to take on this impossible task. With help from Miss San Antonio (Heard) and long time ally Luz (Rodriguez), Machete manages to capture Mendez but he soon discovers that he has uncovered a much larger plot which drastically changes his mission. To make matters worse, both he and Mendez are being hunted by a group of deadly killers like Desdemona (Vergara), her squad of beautiful assassins including the deadly Killjoy (Vega), and a relentless master of disguise named La Camaleón (Lady Gaga, Banderas, Walton Goggins, and Gooding, Jr.). So, there's the setup. If this type of movie isn't your proverbial cup of tea, you should at least be intrigued by the volume of talent on display. Sure, this movie is intentionally cheesy, filled with over the top action, low budget special effects, and cringe worthy dialog, but its all intentionally in place as a throwback to the Grindhouse movies from decades past. If you didn't know, Machete started out as a fake trailer added into the intermission sequence of Robert Rodriguez and Quentin Tarantino's Grindhouse movie project. I've seen a lot of reviews tearing this movie apart for all the things I described above and I suppose that's what a movie critic is supposed to do although I will tell you those fine folds are totally missing the point. If you go into this movie looking for nuanced acting performances and groundbreaking cinematography then you I would recommend completely adjusting your expectations. This movie is intentionally "bad" but done so in a way that is one heck of a wild ride and can be really fun if you allow it to be. Danny Trejo plays Machete as a one note character (See: Badass) which perfectly complements the outrageously colorful cast that Rodriguez has put around him. Machete is a blood splattering, explosion filled roller coaster ride that doesn't let up on delivering the gratuitous goods from beginning to end. You'll notice I haven't even mentioned Mel Gibson yet or what role he plays and I'm going to leave it for you to find out where he takes this movie if you do choose to see it. I will tell you that he becomes a very integral part of the story and helps to set up what is truly an inevitable third installment which will perfectly complete the Machete trilogy. I can tell you right now, Machete will not do well at the box office, but there is a dedicated following in place that will no doubt lovingly place this sequel right next to the original cult classic on their various must watch lists. For my part, I always have a really good time watching this type of movie and have no problem telling people how much fun it is. Robert Rodriguez is carving out quite a niche for himself by paying homage to the Grindhouse genre as well as bringing together a roster of Hispanic actors and actresses for a collaborative effort they may never otherwise have an opportunity to experience.